Hobbies Outside of Work: Jordan lobes to play basketball, volleyball, travel the globe, read, and spend time with his partner and their children who are triplets. 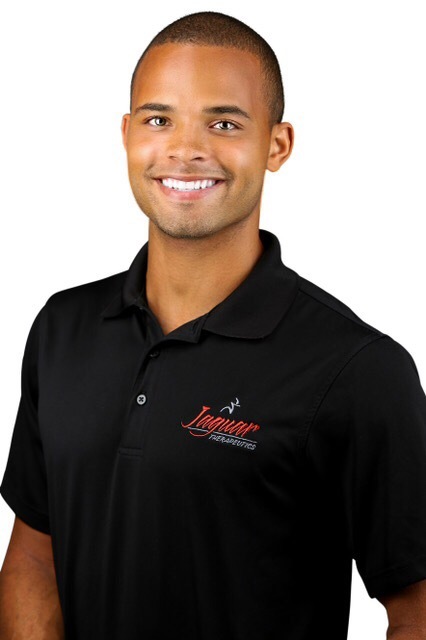 Dr. Jordan Clayborne is a licensed physical therapist and nationally certified strength and conditioning specialist currently working as the head therapist and director at Jaguar Therapeutics in Pinecrest, FL. He is currently completing his orthopedic fellowship at the Institute for Athletic Regeneration where the focus is in sports-related injuries. Upon completion, he will be on a short list of elite physical therapist with the title, and the only “Fellow” in Miami-Dade County and one of 6 in the entire state of Florida. He is active in the American Physical Therapy Association (APTA), and plans to run for office within the Florida chapter in the next few years. Prior to starting physical therapy school, Jordan was captain of the University of Oklahoma Cheerleading team, and played numerous basketball tournaments overseas in Spain. Being so involved in two high impact sports, Jordan witnessed first-hand many of the most common sports injuries. While working closely with his own athletic trainer during college, and under a physiotherapist in Spain, he was able to form an eclectic treatment approach and understanding of sports rehab, before even starting physical therapy school. As a student during his clinical rotations, Dr. Clayborne had the opportunity to work with elite athletes at the collegiate, professional and Olympic level and has gained the trust of some of the biggest names in the NBA. He takes pride in his exceptional manual therapy techniques, unique educational background and strives to center his treatments around the most current research in order to provide the best outcome possible for his patients. Jordan earned his Bachelor’s of Health and Exercise Science at the University of Oklahoma in 2011. He then travelled abroad to Madrid, Spain where he taught English and Science and completed a Master’s in Bilingual Education and Multicultural Studies at the Universidad de Alcalá de Henares in 2012. One year later he started PT school at Texas Woman’s University where he served three years as president of his class, which graduated in 2016. He strongly believes that learning never stops and plans to be involved in some type of coursework throughout his career.